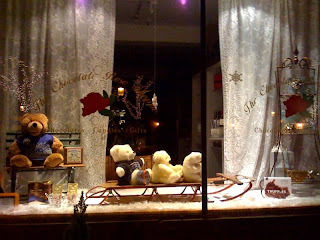 Our latest Chocolate window features three white bears sledding on an antique Flexible Flyer on top of powdery white snow. This window depicts the winter Christmas we just had here in Madison NJ. Cocoa (the brown bear) is now wearing a blue and gray sweater that my three boys wore when they were growing up. He also has on his "If you love Madison, shop Madison" button. The chocolate highlights are: Bellagio White Hot Chocolate, Neuhaus Truffles, an Enjou Chocolat decorated shopping bag, a Godiva Truffle Tin, a Leonidas Praline Collection box, a Leonidas Micky/Mini Disney Collection box, and an antique Hershey's tin. Please come take a look at the window if you have a chance.